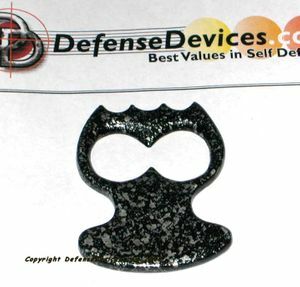 This handy item can open a bottle or serve as a paperweight or belt buckle (no stud, just loop it through). Or it can be a great self defense tool. 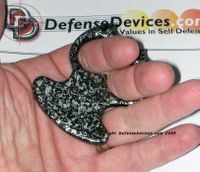 It fits your hand just right for martial arts training or practice. The finger holes are a total of 1.875 inches wide. Can be worn on the index and middle fingers or the next two pretty comfortably. Made of base metal, the bottle opener weighs about 3.4 oz. and is just under 3 inches long and 2.25 inches wide. This model is black with silver speckles. We also have red and a solid black model. Click on the inset picture to enlarge and see how compact the bottle opener is. Sorry, Not sold to MA,CA,FL,NY,MI,RI or IL.